Learning to swim, a rite of passage for many children, can be a positive experience when instructors use patience and creativity. Through age-appropriate games, fledgling swimmers learn water safety skills and basic swim strokes that encourage a lifetime of fun and fitness. According to the American Academy of Pediatrics, providing children with formal swimming lessons might help reduce the number of childhood drownings. For toddlers, the imitation game helps create comfort in the water. Seat the child safely on a step in the shallow end of the pool, positioned directly in front of you. Take a cup of water and pour it on your hair, saying "I'm washing my hair." As you both laugh, hand the cup to the child to pour water on your head, then ask him to wash his hair, too. Rinse and repeat until interest wanes. Try the imitation game with blowing bubbles in the water, keeping the child facing you within easy reach. To encourage swimmers to go underwater, stand in a circle in the shallow end, holding hands while singing the children's song "Ring Around the Rosy." At "we all fall down," students bend their knees and go underwater. Next, line students up in the water, each holding onto the side. Have a volunteer play a music CD with different tempos and beats. Encourage swimmers to keep the beat using a basic up-and-down flutter kick or dolphin kick. Once students are able to blow bubbles, submerge their faces and kick, they are ready to leave the wall. Have the students stand with their backs against the wall in the shallow end and pretend to be Superman, stretching their arms straight out in a flying position while pushing off the wall with two feet. Stand very close so students don't have far to glide, then gradually move farther away to allow students to glide and kick if they are comfortable. Students at home in the water often enjoy a challenge during swim lessons. After assessing your students' abilities, choose an appropriate pool depth and toss submersible items into the water. Swimmers must search underwater for the items and bring them up from the bottom of the pool, returning them to you for points. To eliminate unnecessary competition, assign each student a different color or number of items to find. 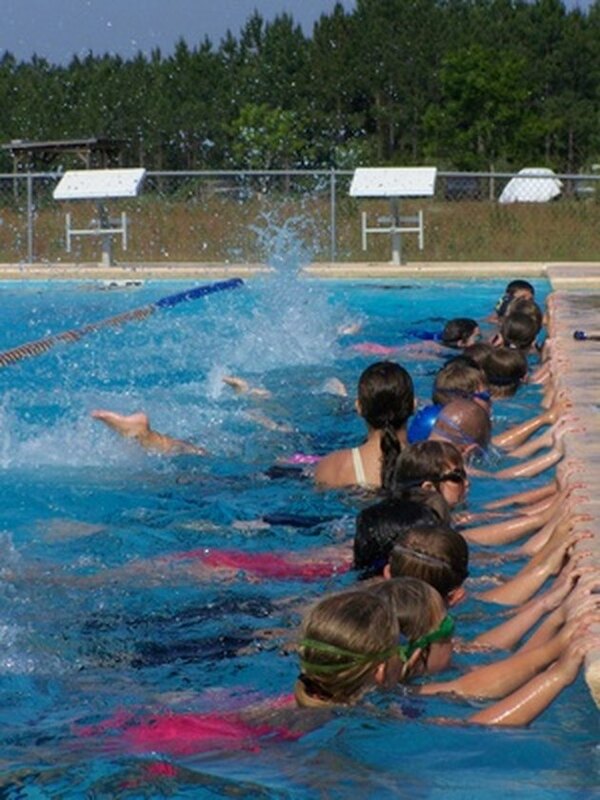 This game helps swimmers gain confidence in their swimming ability and build lung capacity.